Biped locomotion generated by control methods based on Zero-Moment Point (ZMP) has been achieved and its efficacy for stable walking, where ZMP-based walking does not include the falling state, has been verified extensively. The walking control that does not depend on ZMP – we call it dynamical walking – can be used in walking that utilizes kicks by toes, which looks natural but is vulnerable to turnover. Therefore, keeping the walking of dynamical motion stable is indispensable to the realization of human-like natural walking – the authors perceive the human walking, which includes toe off states, as natural walking. Our research group has developed a walking model, which includes slipping, impact, surface-contacting and line-contacting of foot. This model was derived from the Newton-Euler (NE) method. The “Visual Lifting Approach” (VLA) strategy inspired from human walking motion utilizing visual perception, was used in order to enhance robust walking and prevent the robot from falling, without utilizing ZMP. The VLA consists of walking gate generation visual lifting feedback and feedforward. In this study, simulation results confirmed that bipedal walking dynamics, which include a slipping state between foot and floor, converge to a stable walking limit cycle. X. Li, M. Minami, T. Matsuno, and D. Izawa, “Visual Lifting Approach for Bipedal Walking with Slippage,” J. Robot. Mechatron., Vol.29, No.3, pp. 500-508, 2017. M. Vukobratovic, A. Frank, and D. Juricic, “On the Stability of Biped Locomotion,” IEEE Trans. on Biomedical Engineering, Vol.17, No.1, 1970. M. Vukobratovic and J. Stepanenko, “On the Stability of Anthropomorphic Systems,” Mathematical Biosciences, Vol.15, pp. 1-37, 1972. S. Colins, A. Ruina, R. Tedrake, and M. Wisse, “Efficient Bipedal Robots Based on Passive-Dynamic Walkers,” Science, Vol.307, pp. 1082-1085, 2005. 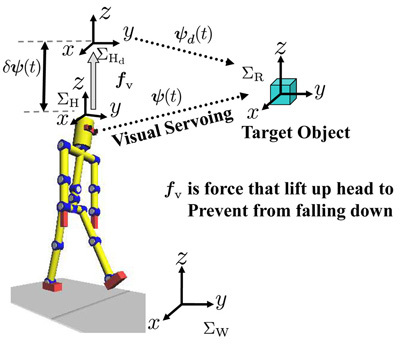 J. Pratt, P. Dilworth, and G. Pratt, “Virtual Model Control of a Bipedal Walking Robot,” Proc. of IEEE Int. Conf. on Robotics and Automation,” pp. 193-198, 1997. R. E. Westervelt, W. J. Grizzle, and E. D. Koditschek, “Hybrid Zero Dynamics of Planar Biped Walkers,” IEEE Trans. on Automatic Control, Vol.48, No.1, pp. 42-56, 2003. Y. Harada, J. Takahashi, D. Nenchev, and D. Sato, “Limit Cycle Based Walk of a Powered 7DOF 3D Biped with Flat Feet,” Proc. of IEEE/RSJ Int. Conf. on Intelligent Robots and Systems, pp. 3623-3628, 2010. D. Peng and K. G. Shin, “Modeling of Concurrent Task Execution in a Distributed System for Real-Time Control,” IEEE Trans. on Computers, Vol.C-36, No.4, pp. 510-516, April 1987. Y. Nakamura and K. Yamane, “Dynamics of Kinematic Chains with Discontinuous Changes of Constraints – Application to Human Figures that Move in Contact with the Environments –,” J. of RSJ, Vol.18, No.3, pp. 435-443, 2000 (in Japanese). K. Yamane and Y. Nakamura, “Dynamics Filter – Concept and Implementation of On-Line Motion Generator for Human Figures,” IEEE Trans. on Robotics and Automation, Vol.19, No.3, pp. 421-432, 2003. X. Li, H. Imanishi, M. Minami, T. Matsuno, and A. Yanou, “Dynamical Model of Walking Transition Considering Nonlinear Friction with Floor,” J. of Advanced Computational Intelligence and Intelligent Informatics, Vol.20, No.6, 2016. W. Song, M. Minami, and Y. Zhang, “A Visual Lifting Approach for Dynamic Bipedal Walking,” Int. J. of Advanced Robotic Systems, Vol.9, pp. 1-8, 2012. A. Yanou, M. Minami, T. Maeba, and Y. Kobayashi, “A First Step of Humanoid’s Walking by Two Degree-of-freedom Generalized Predictive Control Combined with Visual Lifting Stabilization,” Proc. of the 39th Annual Conf. of the IEEE Industrial Electronics Society (IECON2013), pp. 6357-6362, 2013. W. Song, M. Minami, T. Maeba, Y. Zhang, and A. Yanou, “Visual Lifting Stabilization of Dynamic Bipedal Walking,” Proc. of 2011 IEEE-RAS Int. Conf. on Humanoid Robots, pp. 345-351, 2011. N. Hogan, “Impedance Control; An Approach to Manipulation, Parts I–III,” ASME J. of Dynamics Systems, Measurement, and Control Vol.107, No.1, pp. 1-24, 1985. W. Song, M. Minami, F. Yu, Y. Zhang, and A. Yanou, “3-D Hand & Eye-Vergence Approaching Visual Servoing with Lyapunov-Stable Pose Tracking,” Proc. of IEEE Int. Conf. on Robotics and Automation, pp. 5210-5217, 2011. F. Yu, W. Song, and M. Minami, “Visual Servoing with Quick Eye-Vergence to Enhance Trackability and Stability,” Proc. of IEEE/RSJ Int. Conf. on Intelligent Robots and Systems, pp. 6228-6233, 2010. M. Kouchi, M. Mochimaru, H. Iwasawa, and S. Mitani, “Anthropometric database for Japanese Population 1997-98,” Japanese Industrial Standards Center (AIST, MITI), 2000.